A small private museum run by an ex-soldier-turned-mine-clearer alongside an NGO/charity near Siem Reap (Angkor), Cambodia. 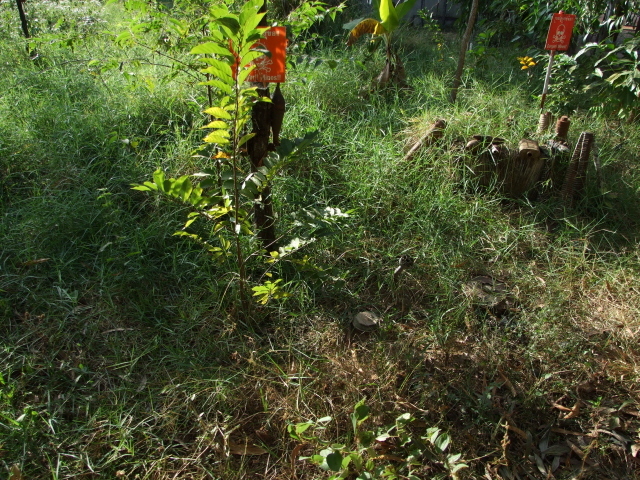 It's dedicated to, as the name suggests, landmines (so-called "anti-personnel" mines especially) – which are the lingering curse of previous horrors during the Khmer Rouge years which left Cambodia one of the world's most heavily mine-infested countries. More background info: Poor Cambodia has seen decades of conflict, including being drawn into the Vietnam War and subsequently being subjected to one of the worst genocides ever, at the hands of the Khmer Rouge, between 1975 and 1979 (see also Tuol Sleng and Choeung Ek). But the horrors continued even after that – the Khmer Rouge, driven out of Phnom Penh and much of the southern parts of the country by the Vietnamese in 1979 retreated to the north (see Anlong Veng and Preah Vihear), where they held out (and continued their terror) until the late 1990s … in the midst of the "security" provided by all their minefields. The legacy of all this today is not just trauma – it's also still killing people: millions of landmines are still left all over the country, but especially in the north. To this day they claim hundreds of casualties every year and maim even more victims. The victims are often children. The topic has attracted a lot of attention over the last decade or two and is being tackled (perhaps most famously Princess Diana helped publicize the issue). But progress is slow (some reckon it'll take hundreds of years to clear all those mines) – and expensive (it can cost up to 1000 USD to remove a landmine, as opposed to as little as 3 USD to make one!). Production at least has dwindled, and countless mines are being cleared every year – but there is still a lot of work to be done. It is also noteworthy that the list of over 150 countries who have committed themselves to an international Mine Ban Treaty, also known as "Ottawa Treaty", does not include some of the world's strongest military nations, such as China, India, Israel, Russia and the USA. In Cambodia, one individual has been making a particular personal effort: he goes by the (adopted) name of Aki Ra. He used to be a Khmer Rouge child soldier (his parents had been killed by the Khmer Rouge when he was only about five) and laid thousands of mines himself back then. He later switched sides, defecting to the Vietnamese Army (who had thrown the Khmer Rouge out of power in 1979) and when Vietnam pulled out of Cambodia he remained in the Cambodian army for a couple of years more, still fighting remaining factions of Khmer Rouge. After that he joined the UN peacekeeping forces and was trained as a de-miner. He's been busy clearing mines, also independently (after the UN left), privately and often literally on his own, ever since. It is the first officially accredited museum of its kind – and absolutely unmissable when in the area, well worth the detour. In a series of rooms there are more shells, mines, small weapons and other rusting military hardware on display. 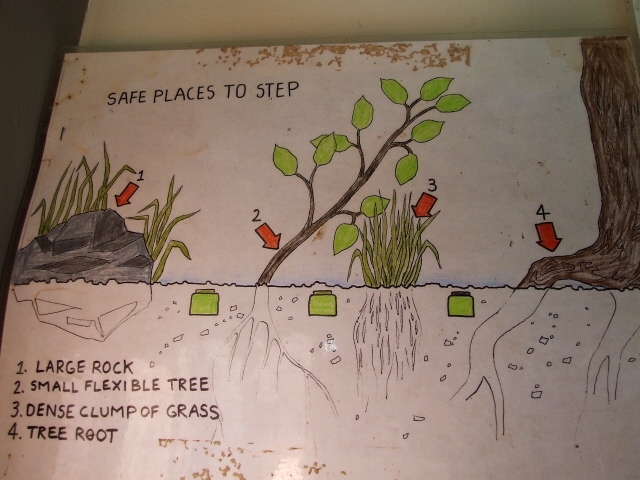 But what is much more captivating are the informational charts, texts (all in flawless English) and photos – and some rather graphic artistic impressions, such as paintings depicting scenes of landmine-maimed children surrounded by desparate country folk unable to help. 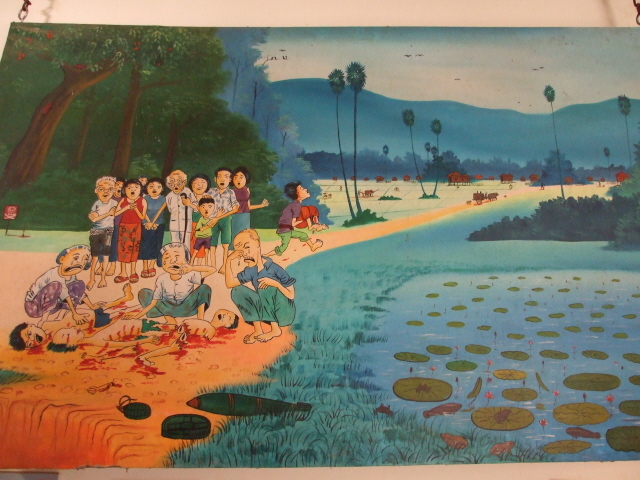 One particularly striking exhibit is an enlarged (and somewhat faded) fake cover of a fictitious Tintin comic book entitled "Tintin au Cambodge" showing the hero on crutches with half a leg replaced by a prosthetic artificial one … with Angkor Wat and a landmine warning sign in the background. Apparently you can also buy postcards of this in Cambodia (although I personally never saw one). Some find this too cynical, and on its own it may be so, but within the context of this museum it certainly helps homing in the point. Adjacent to the museum is a shop, where you can do worse than channelling some well-needed money into this very worthwhile institution. Even if you don't actually want to buy anything, leave a donation. It's hard to imagine a better cause. The shop does, however, offer various things that may be irresistible (as they were for me) in any case, including a DVD with a documentary about the museum's founder Aki Ra's de-mining and charity work, very decent T-shirts (some subtle enough, others more drastic), as well as postcards and informational charts. Rather than caving in to the omnipresent (and often quite persistent) souvenir-sellers proffering standard Angkor-Wat shirts and stuff everywhere around the more touristy sights of Angkor/Siem Reap, I instead went on a little shopping spree in the friendly Landmine Museum's shop (in addition to leaving a donation). I admit it: rarely have I been more touched by a museum and its cause than at this particular place. A true gem. In a way I find it even symbolic of the whole paradox of Cambodia – such a horrifically grim story, but such gentle people. 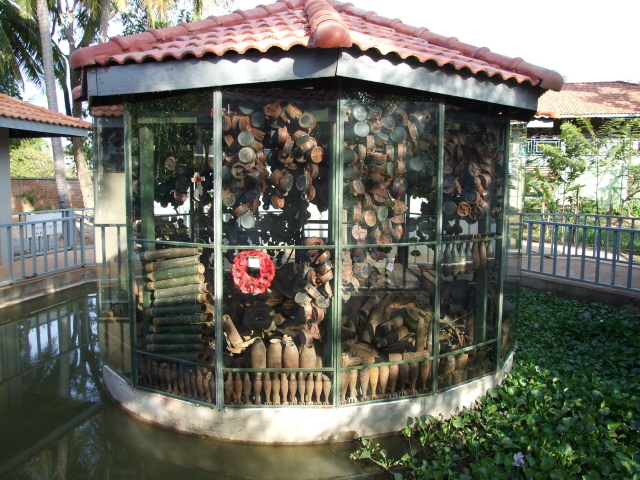 The Landmine Museum is both to the extreme. Even for the more "casual" tourist it is an unmissable addition to Angkor's more mainstream attractions. Access and costs: fairly easy and cheap. Details: about a 30-40 minute drive by car – or local tuctuc (motorcycle taxi) – from the centre of Siem Reap. It's en route to the temple complex of Banteay Srey on the right hand side of the road. This route also passes not far from Ta Prohm. Admission: officially the museum charged a 1 USD "donation" instead of an entry fee as such when I was there. But feel free to give a bit more (and you can also leave a donation in the museum shop later), as it's for a good cause. Opening hours: daily between 7:30 a.m. and 5:30 p.m.
Time required: half an hour may be enough for a quick visit, better allow an hour to study everything in detail (and extra time if you want to do the mock "de-mining" exercise in the "mine garden") – plus time for getting there and back; it's probably best to incorporate the visit into a drive to the Banteay Srey (and Ta Prohm) anyway, that way no added driving time will come on top. Combinations with other dark destinations: in general see Cambodia – in the immediate vicinity of the museum there's nothing else of direct interest to the dark tourist (unless you count the very real minefield-infested lands further away from Siem Reap/Angkor, esp. to the north). 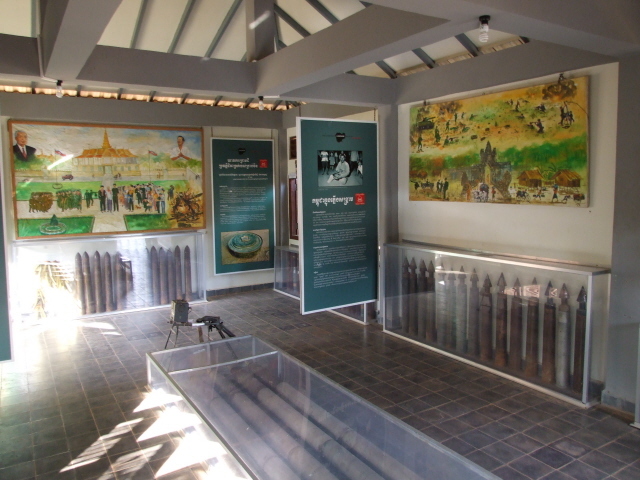 Siem Reap, however, also has a War Museum, which is (topically) related to the Landmine Museum in that it also displays old shells and mines, but mostly it is about military gear (some of which you can apparently even handle). The biggest exhibits include an old Chinese fighter jet, a Soviet-built helicopter (neither are in good shape), several rusting tanks (including mere skeletons, some taken here from Anlong Veng in recent years) and various big and small guns … overall it's much less informational than the Landmine Museum, but can make a worthwhile addition (though at 3 USD it's a little overpriced in comparison – except perhaps for military buffs). 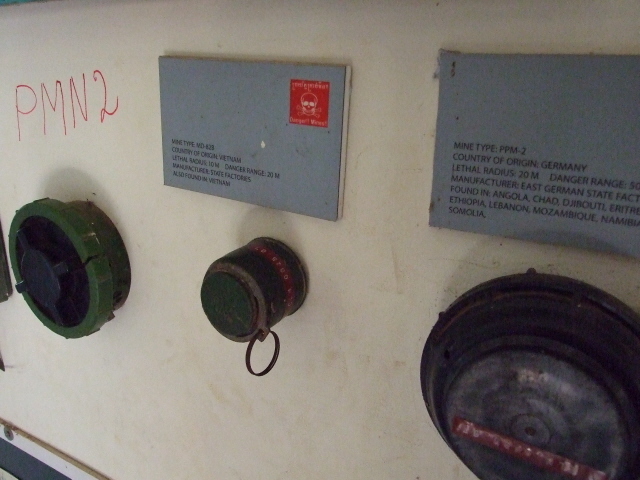 If you have time for only one of them, then favour the Landmine Museum. (In fact there seems to be a little bit of confusion about the two places – so make sure you go to the correct one.) 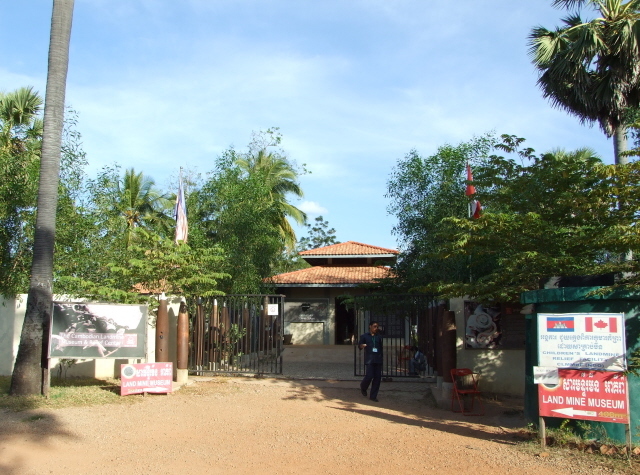 The War Museum is to the west of Siem Reap nearer the airport (to the right off the main road, coming from the town centre). Siem Reap also has its own small "killing fields" memorial (like those you can find all over the country), a partly skulls-and-bones filled stupa at Wat Thmei, halfway between the town and Angkor. It doesn't compare in any way to the national site of this nature: Choeung Ek near Phnom Penh. The temple complex of Ta Prohm, which the route to the Landmine Museum goes past, may also qualify as somewhat dark-ish, in as much as it is the one part of Angkor that has deliberately been left in the jungle-clad state that the whole cultural site was in before it was rediscovered and cleared of trees and undergrowth. So Ta Prohm is the only site at Angkor that gives you an impression of what it must have been like when these amazing places were discovered in the jungle, hundreds of years after they had been abandoned. Well, or so it could be if it weren't for the crowds. Ta Prohm has received an extra boost of fame from having been used as a film set for the Lara Croft movie (and computer games). It's best to come here either very early (before the rush) or late in the afternoon (when the light is best for photography anyway). Or: take the longer trip out to Beng Melea, which is regarded by some as even better than Ta Prohm and certainly competes with its Indiana-Jones-like "abandoned"/"lost world" atmosphere; and to link it in with the Landmine Museum: Beng Melea is still surrounded by minefields – you'll see the warning signs, or the signs erected by the de-mining squads after they've finished their jobs – and has in fact only been made accessible in more recent years … it's an ongoing job. Combinations with non-dark destinations: The Landmine Museum is near Cambodia's main tourist attraction, one of the world's Top-10 cultural heritage sights: Angkor Wat (and the surrounding other ancient temple complexes) – so need we say more? Yes, maybe: Many people with too little time don't get out to some of the less well-publicized temples, and of these Banteay Srey is a particular gem. Much smaller than the huge complexes of Angkor Wat and Angkor Thom, it is however particularly impressive in the details. It boasts the very best, most delicate, and incredibly well-preserved Khmer carvings of them all. So delicate, in fact, that the temple has earned itself the additional nickname "the women's temple" (due to the assumption that the fine carving work couldn't possibly be the work of men's hands …). And since Banteay Srey is just four miles up the road from the Landmine Museum, it's a worth-while combination. Siem Reap is, for obvious enough reasons, the main tourist hub of the country, with all manner of touristy offerings (it's a "tourist bubble", a colleague once said), and indeed most tourists don't go anywhere else but Siem Reap and Angkor; but Siem Reap also serves as a base for further explorations, e.g. to the huge Tonle Sap lake. And of course Cambodia's capital Phnom Penh in the south of the country is also well worth a visit.